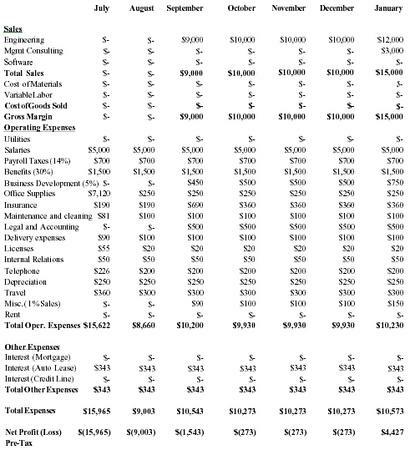 HLC's business plan contains informative financials for anyone considering entering the engineering/management consulting business. One interesting aspect of the plan is HLC's plan of networking with other similar businesses to work together and create more opportunities. Herman Livingston Consultants (HLC) seeks to raise equity capital of $28,000.00 principal equity for start-up costs involved with an engineering/management consulting firm. This includes the purchase of furniture, equipment and inventory; renovations and improvements at Los Angeles, California office site, and maintenance of sufficient cash reserves. This plan provides a description of the business opportunity and an outline and time line of the start-up period for HLC. During his eight year involvement with the architecture, engineering and construction (A/E/C) industry, Herman Livingston realized unresolved obstacles existed in many organizations. Despite the lack of qualified management to correct the problems, most A/E/C owners hesitate to seek outside managerial assistance. Mainly this is due to the justifiable belief that an MBA management consultant would not have the technical knowledge to develop applied solutions to A/E/C firms in transition. This gap in the market place inspired Herman Livingston to establish Herman Livingston Consultants (HLC), a professional service company specializing in providing engineering and management consulting (E/MC) services along with software sales to A/E/C companies and public works departments to enhance and strengthen their organizations and to meet the needs of their clients. In conjunction with established E/MC and software firms, HLC will provide the essential technical knowledge and products to develop goal oriented solutions that address the client's strengths and weaknesses. Because HLC will be able to chose temporary partnerships with all types of engineering companies and/or management consulting firms based on the job at hand, the flexibility of the company is virtually unlimited. HLC can provide cost effective services for small and large companies, from the public and private sectors. The flexibility to create any size group is further enhanced by Herman Livingston's project management background and strong industry understanding. In addition to providing professional services, HLC will assess the client's computer needs, if requested, and recommend alternate courses of action. Ultimately, HLC will work to implement both installation and training of new software that will greatly benefit the client. The approach will involve both a thorough understanding of the available software tools and the ability to provide cost/benefit proposals for the client to take action. HLC plans to arrange for a percentage-of-sale fee paid by the software supplier along with a technical service fee paid by the client. The goal here is to leave the client with a product that will greatly enhance their company. In June 1996, HLC plans to commence business at 3035 Harbor Drive, Ste.206, Los Angeles, CA. HLC will provide engineering and management consulting services to A/E/C companies and public works departments to enhance and strengthen their organizations and to meet the needs of their clients. As many private companies and public agencies have recently trimmed their staffs, HLC will seek to provide the services that they can no longer provide internally. Initially, HLC will target 80% engineering/20% management consulting strategy and shift to 30% engineering/70% management consulting as the company grows. The firm will continue to provide engineering services in order to stay in touch with clients. The goal of HLC is to be the management consultant company that the A/E/C industry and public works departments in Southern California ("target region") look to when they are faced with unique situations. Presently, the value of total construction in Southern California stands at $9.3 billion, which includes heavy construction, non-residential, and multi-unit residential. The demand for architecture and engineering companies is driven by construction activity. There are presently 20,560 A/E/C companies located in the target region of which a majority are headquartered here. Below is the list of top A/E/C companies based in the target region; Adwell Corporation, Hinsworth Corporation, and JAX Group are the top 3 A/E/C firms in the world. Note: The firms above are the five largest construction management companies based in Southern California. * 1993 contract values listed are in millions. ** JAX Group owns Turnville Construction International, Los Angeles. Although the potential for finding a niche with large A/E/C organizations is the greatest, HLC will also target public agencies. There are hundreds of public agencies in the target region, including cities, counties, transportation boards and state agencies. Often public agencies are not equipped to provide adequate community services, due to both the lack of staff and knowledge specific to each project. HLC can provide public officials with technology support to complete each complex, varied project with the greatest efficiency. In addition to providing consulting for private companies and public agencies, HLC will strive to both assist and partner with other management consulting firms. There will be several A/E/C company assignments that a small firm cannot physically handle. In these situations, HLC will position itself as the industry specialist working with the project team. There are less than a hundred management consulting firms that provide services to the target market and work in the target region. Direct approach to all management levels of the target market, including cold calls, letters and "at work" presentations. This presentation will involve meeting the prospective client at his/her office to discuss concerns and projects and to find common ground in which HLC can help. Typically, reference material will include a laptop computer with various Powerpoint presentations, work portfolio, referral lists, business cards, brochures and a calendar of upcoming events. Networking events where business cards and brochures can be exchanged. Published papers in professional A/E/C journals related to HLC's line of business. Referrals from other professional companies and public agencies. HLC's strategic location near major freeways and the Los Angeles International Airport (LAX). The competition consists of engineering firms, management consultants, and employees at the client's office. Even though other firms have more people and experience, HLC will win business by understanding the interaction of technical personnel and management. The key to beating the competition is by strategically balancing price, efficiency, and differentiation. We will provide work above the client's expectations and the competition's ability (i.e. early completion, less cost, future paradigm analysis). Finally, in order to best understand the competition, HLC will analyze other company's successes and failures on a regular basis. HLC plans on capturing only a small portion of the market. Fortunately, the market is not very competitive because most engineers become managers within engineering companies and management consulting firms don't understand the cultures of A/E/C companies enough to quickly root out problems. A complete market analysis will be provided in the Marketing Plan. HLC is currently utilizing approx. 500 square feet on the first floor of a two-story masonry building with cement floor at 3035 Harbor Drive, Ste. 206, Los Angeles, CA. HLC plans to perform leasehold improvements, including the addition of a conference room, small kitchen, and interior redecoration. The building is divided into (1) a mechanical/electrical engineering shop; (2) a multipurpose office, including one restroom with separate entry; (3) conference room with kitchenette and storage; and (4) upstairs office space presently being leased by Sullivan mechanical engineers. HLC will occupy 64 sq. ft. of the multipurpose office and the entire 210 sq. ft. of the remodeled conference room. The current building owner, Caldwell Livingston, has generously offered to provide an equity contribution to the business for the first year. The area is zoned for commercial use. Harbor Drive is a heavily traveled, east-west commercial/residential route with most nearby businesses either dining establishments or repair (service) shops. Within a few blocks, there is convenient access to many of Southern California's freeways. Also nearby, the SC transit station provides rail service throughout the South Bay cities. Schwimmer & Associates— an independent, management consulting firm run by Calvin Schwimmer, a registered civil engineer and college professor. Mr. Schwimmer is a project management consultant assisting engineering firms and public agencies in proposal preparation, cost estimating, project scheduling, and project management activities. Many of Mr. Schwimmer's clients are also present engineering clients of Herman Livingston. His previous employer was the Alexander Co., where Mr. Schwimmer worked as a project manager. Since Schwimmer & Associates is small and focuses on project management, HLC has confidence that the two firms will have several opportunities to work together rather than compete. The Coleman Group— a twenty-four year old management consulting firm that caters strictly to the A/E/C industry. According to President Aaron Coleman, The Coleman Group has worked with more than 1,000 clients (less than 0.1% of the market) and is headquartered in San Antonio. The firm has only 13 consultants (6 architects, 4 engineers, and 3 behavioral scientists) that respond proactively to clients by understanding the market and by writing and speaking to professional organizations. 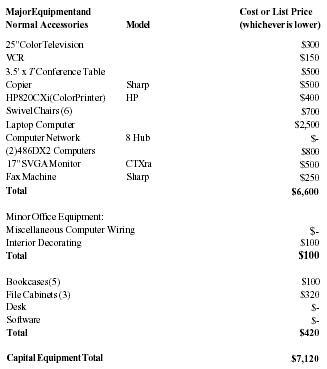 Consultants are not salaried, but rather rely on assignment fees. The Coleman Group will be used as a model for HLC both in business development and proactivity, but their limited size minimizes The Coleman Group as a competitive threat. As with Schwimmer & Associates, HLC will meet with The Coleman Group to discuss partnering opportunities for large consulting assignments. The benefits to The Coleman Group are those in the business description outlined above. Piedmont & Co. — with 80,000 people in offices worldwide, Piedmont claims to have broad experience in serving the global engineering and construction industry by providing a variety of consulting, audit and tax related services. Piedmont's services include business process reengineering, performance measures, strategic planning, organizational design, customer satisfaction, ISO 9000, project management, global best practices, human resource management, materials and costs management, business systems, and litigation. Piedmont's engineering and construction industry group is headed by Ms. Connie Hall and is headquartered in Atlanta, Georgia. HLC learned during a year of competitive research that Piedmont was not able respond to a request of an engineering manager seeking assistance. After several calls to reach the right person, HLC finally received a generic brochure package addressed to the wrong company. This was the extent of Piedmont's pursuit of potential work. HLC can much more successfully reach the A/E/C market in southern California. Fowler Reynolds (A Subsidiary of the Hinsworth Corp.)— has 16 quality centers throughout the United States claiming to provide new and innovative quality methods, systems and technologies that are providing radical improvements to their clients. Fowler Reynolds states that they provide "the leading edge in changing the Architectural/Engineering and Construction Community and directly affecting the bottom line." Their intent is to help companies and agencies that the Hinsworth Corp. works with (which is extensive) in providing higher quality, ISO 9000 certification, and executive management support. In July 1995, HLC met with Mr. Steve Jenkins, Director of Quality Assurance, to discuss both Fowler Reynolds' business and potential partnering opportunities. First impressions of Fowler Reynolds were that this business unit was being driven by one man, Shawn Reynolds, who had good intentions, but a flawed business philosophy. The problem is that A/E/C companies do not want a competitor knowing what is wrong with their business. Also, Fowler Reynolds has the same bureaucratic structure that potential clients deal with in their own businesses. By meeting's end, Mr. Jenkin's almost desperately asked that HLC come back with ideas to help them build their business. Since this meeting, no mention within the industry has been made about Fowler Reynolds. Indirect competition exists from internal staffs at HLC client offices. If clients have the options, they will and should have their staff provide the service. HLC will direct the client to use their internal staff if it is determined prudent to do so. However, from an objectivity standpoint, an outside consultant will often be the best solution. Herman Livingston is a native Californian and has resided in Southern California all his life. After graduating valedictorian from South High School, he attended the University of Southern California (USC) and received his BS in Building Science in 1987. He began his professional engineering career with the State of California Department of Transportation (Caltrans), working in both construction and project planning. Then, Mr. Livingston worked for Trudell Engineering Company focusing on engineering design, business development, and research. Finally, he worked as a project and office manager for Johnson Associates Infrastructure, Inc. (JAI). While at JAI, Mr. Livingston received his professional engineering registration from the States of California (1993) and Florida (1995). He completed his MS in Engineering Management in 1994 learning about proven management techniques used in all engineering industries. Karen Livingston, wife of Herman Livingston, is also a native Californian. After graduating in the top 5% of her class at Beachside High school, Ms. Livingston moved to Los Angeles to pursue a BFA at the prestigious California College of Design. Ms. Livingston worked seven years at Nouveau Fashion Industries as technical designer and import manager where her responsibilities included developing and updating procedural manuals for the fitting and import departments. During this time, she also wrote two novels and had several short stories published. In 1995, Ms. Livingston started her own business and has worked with such companies as Nostalgic Antiques, developing a computerized inventory system, designing marketing campaigns and product displays and creating an updated business plan. Both Mr. and Ms. Livingston believe their complementary knowledge and goals will make HLC a success. In particular, Mr. Livingston understands the A/E/C industry and is a highly regarded member of the community while Ms. Livingston is a proven quality assurance and report writing expert. Since Mr. Livingston has industry track record and management experience, he will be responsible for business development and project control. Ms. Livingston will be primarily responsible for proposal preparation, research and product quality assurance and control. Together they will set all business policies and personnel decisions. 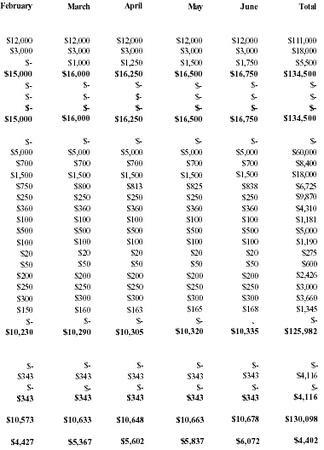 The Livingston's will draw a combined salary of $5,000/month based upon a minimum 40% billing utilization. Ms. Livingston will retain outside business activities earning approximately $500/month and expected to increase. 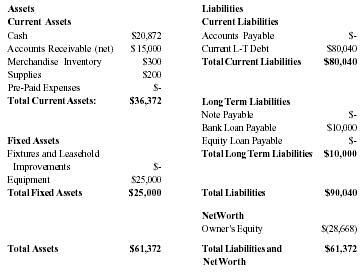 The Livingston's personal expenditures total approximately $4,500/month, including housing, automobiles, insurance, etc. In order to augment their skills, HLC has enlisted an advisory board consisting of John Commons, founder and president of Capital Management; Dean White, office manager of Dunstable, Goody & Company; Alice Reed, senior associate of Corbin Consulting; Darin Johnson, project manager of Parkway Co.; Trent Silman, vice president of XRS Group, Inc.; and Calvin Schwimmer, founder and principal of Schwimmer & Associates. This board along with several other professional associates will provide on-going management review. Initially, HLC will not hire any outside office administrative help. HLC will strive to grow the business quickly in order to maximize profits, but only two additional employees have been planned during the first two years. Employees will be chosen based upon their superior knowledge and understanding of their business and will be compensated accordingly. Projected Income - "Most Likely"